Candles have drastically changed over the years. In past times candles were more functional than decorative. 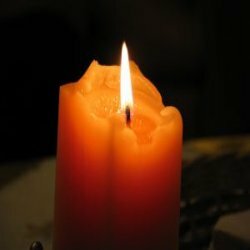 The most common candles were made right in the home and often used as the primary light source. They were made from tallow, were an off white color and would burn with a lot of smoke. Today’s candles are colorful, scented and decorative. They are made from numerous different materials which provide not only beauty but wonderful aromas. – People who are buying candles for their home use three main factors when making their selection. Their first consideration is fragrance, shape and color are a far distant second. – Americans spend close to 2 billion dollars every year on candles. – Candles have been used as clocks by many different cultures. Candles were an effective way of keeping time on a cloudy day or at night. – In India, temples would make candles from cinnamon. They would boil the cinnamon and extract the wax. – Candles in ancient Japan were made from the wax produced by insects and seeds. – King Alfred the Great (849 to 899) was known to use a candle clock. Each candle was weighed and carefully measured. It would take four hours to burn one candle and each candle was marked in twenty minute intervals. – By the 13th century, in both France and England, candle making was a guild craft. A person who made candles was called a Chandler. Chandlers often sold their wares door to door. – Candles suffered a major decline in popularity with the invention of kerosene. They continued to decline when the light bulb was invented. Today, candles are becoming more and more popular for the relaxing atmosphere that they provide and the fragrances that they produce. – Many people who burn candles do so for religious purposes. Candles are also used in meditation and aromatherapy. – People who burn candles for meditation and in certain religious practices attribute different meanings to the color of the candles. – In recent years, hospitals in the UK have noticed a rise in the number of patients being admitted to emergency for candle related injuries. Typical injuries include burns from both hot wax and open flame. – Fire Departments in the UK have noticed an increase in the number of house fires due to candles. This increase reflects the fact that candles have been gaining in popularity and usage. Fires in homes are being caused by candles being left unattended, people placing candles too close to flammable materials, as well as, placing candles on unsuitable surfaces. – Rathbornes Candles is the world’s oldest candle manufacturer. The company was founded in Dublin in 1488. The company contracted with the city of Dublin to provide street lighting in the 17th century. – The first chandeliers used candles. A simple medieval chandelier was called a candlebeam. A candlebeam was a wooden cross that would have one or more cups and prickets to hold the candles. – A candelabra is a candlestick that usually has branches and holds more than one candle. – Bronze molds were used in ancient Rome to make candles. – In medieval times, candles were made by attaching three or four wicks to a long rod which was called a broach. The wicks were then carefully dipped in tallow. After the first couple of dippings the candles would be allowed to cool. This process would be repeated over and over until the desired thickness was achieved. This entry was posted in Fun Trivia, Paranormal Trivia and tagged candle facts, candle information, candle trivia, candles by Jane. Bookmark the permalink.